Alaska is located far to the north of the lower 48 states, and while AK is by far the biggest state in the Union, its climate is not conducive to mass habitation and even in 2019, Internet connections for gambling on poker websites for that matter. As such, real money online poker hasn’t exactly thrived in The Last Frontier, nor has legal gambling in general. That doesn’t mean you can’t play online poker from Alaska though. Despite the smatterings of social gamblers and betting fans interspersed between Alaska’s snowy mountains, the state’s citizens have yet to embrace the idea of a regulated Internet poker and legal gambling bill. Right now there isn’t exactly a massive hunger for Internet poker rooms in AK. If anything, the widely Republican state has proven vehemently opposed to lawful gambling, deeming it a terrible vice and a source of moral corruption. Still, live real money Texas Hold’em poker is still technically legal in Alaska – you just wouldn’t know it. Get ready to pull up a seat and test out your skills on the table. Gamblers in The Last Frontier can play at a real money US poker site. 2 Can Players From Alaska Play Online Poker? 3 Is Online Poker Legal In Alaska? The last real gambling headline involving Alaska dates way back to 2005. It was then that Alaskan furrier and avid poker player Perry Green campaigned for the legalization of poker . Claiming that poker was a real way of earning a living, Perry met with several prominent AK state officials including Rep. Pete Knott and Senator John Cowdery, both of whom supported his cause. Green also argued that poker was thriving in the underground and that by legalizing it, the amount of illicit poker gambling activity would diminish. Shortly thereafter, card rooms were legalized in Alaska, although the government made procuring a license to operate a facility exceedingly difficult. For one, the licensing fee was set at $25,000 plus a $10,000 annual renewal rate – per real cash poker table . That alone eliminated all but the biggest lawful gambling players from opening up a card room in Alaska. To date, we have been unable to find any accounts of legit poker card rooms currently operating in AK and you won’t find any tribal legal live poker venues in Alaska. Can Players From Alaska Play Online Poker? Sure, as long as they’ve got a stable Internet connection, there is very little preventing Alaskans from hitting the virtual green felt at real money poker websites in 2019. Our top recommended real-money US poker sites all accept Texas Hold’em poker players from Alaska – good news considering that Alaska’s severe climate isn’t exactly compatible with too many outdoor activities. Signing up for an Internet poker website account from a cabin in Anchorage is as easy as it is in a sky-rise in New York. Simply provide a few pieces of pertinent information, then log in, make your first deposit and start your poker gambling straight away. While Alaskan law doesn’t specifically address the issue of online poker websites, its general poker gambling laws are quite strict in nature. That being said, most of Alaska’s gambling statutes are targeted towards illicit operators, not those actual poker players betting in underground games. And while you should always seek professional advice before participating in an act that’s not clearly defined as legal or illegal, you can take comfort in knowing that as of 2015 there are no accounts of online poker players in Alaska being prosecuted for wagering funds online at Internet poker websites. Gambling means that a person stakes or risks something of value upon the outcome of a contest of chance or a future contingent event not under the person’s control or influence, upon an agreement or understanding that that person or someone else will receive something of value in the event of a certain outcome. Section 11.66.280(2). Because Alaska does not explicitly define poker as a game of skill, it falls under the scope of gambling both in the real world and virtually at poker betting websites on the Internet. Social game means gambling in a home where no house player, house bank, or house odds exist and where there is no house income from the operation of the game. Section 11.66.280(9). In other words, if the house isn’t charging a rake or entry fee for you to play real cash poker, then the game is legal. But then what are the penalties for players participating in a raked Texas Hold’em game? Alaskan law merely states that unlawful gambling is a violation for the first offense. Subsequent offenses are considered a class B misdemeanor – not exactly a slap on the wrist, but far less severe than the penalties levied against illegal poker gambling operators who run poker websites from inside Alaska. A person commits the crime of promoting gambling in the first degree if the person promotes or profits from an unlawful gambling enterprise. Promoting gambling in the first degree is a class C felony. Section 11.66.210(a-b). Gambling enterprise means a gambling business that includes five or more persons who conduct, finance, manage, supervise, direct, or own all or part of the business; has been or remains in substantially continuous operation for a period in excess of 30 days or has a gross income of $2,000 or more in any single day…, and is not sanctioned by the state to conduct operations. Other gambling operators are subject to class A misdemeanors. Overall, Alaska’s 2019 online poker and gambling laws are far from the strictest we’ve seen. They could still potentially be interpreted to read that all forms of poker, including Internet poker gambling, are illegal but the lack of prosecutions proves that AK law enforcement have got bigger, more serious issues on their mind. 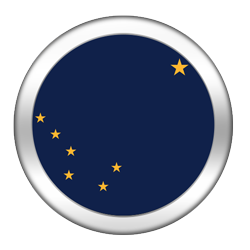 To review Alaskan gambling law , please click on the link located in the “References” section. The Yukon Gold Rush of the late-19th century brought approximately 100,000 prospectors to Alaska, The Last Frontier. And while all but 4,000 would go home empty, of the ones that struck it rich many would gamble real cash and drink their money away at one of Alaska’s makeshift saloons . Keep in mind that at the time, Alaska was not yet granted statehood, and as such, there were very few regulations preventing settlers from participating in real money poker betting. But it wouldn’t be until the 1990s that the gambling issue would be addressed by the government. During that time, a law was enacted preventing charitable Monte Carlo nights. Known by some as casino nights, Alaska’s more conservative state officials feared that legal mock gambling events would compel the state’s tribes to lobby for the opening of fully fledged legit casinos. Today in 2019, only very limited lawful real cash charitable gambling events are permitted by the AK state. In 2005, poker, bridge, rummy and other games were legalized in Alaska, but only under very rigid conditions. Tribal facilities exist now, but they only support pull tab and bingo games not real money poker or casino games and thus are not considered casinos. By 2008, the state asked voters for their opinion regarding the establishment of a gambling commission. They reneged and the citizens of Alaska never got their chance to vote on the issue. Since then no other forms of gambling have been legalized or even addressed, and as of 2015 there have been no legal or public discussions about regulating Internet poker. Although pari-mutuel wagering is not permitted, Alaska makes several notable legal exceptions for dog mushing and fishing competitions and gambling on both of these events is still completely legit in 2019. Commercial and tribal casinos offering real cash betting on poker games like Texas Hold’em are not legal in Alaska in 2019. Alaska is one of only a handful of US states that doesn’t boast a state lottery. Charitable gambling is permissible, but limited. In short, gamblers who enjoy spending their winters sitting around the green felt gambling on poker might have to go out of state in [getYar]. It’s been around a decade since Alaska has bent its rigid gambling laws, and even that was a minor victory for pro-gambling advocates, of which there are few. In general, most of Alaska’s citizens are apathetic towards Internet poker gambling in 2019 and other land based betting games, and could hardly be expected to support a gambling bill that would make poker websites legal. This doesn’t bode well for the future of state regulated Internet Texas Hold’em gambling in the Last Frontier. The legalization of live poker provided hope and little else, as there are still no heavily traversed real cash poker card rooms in Alaska. And without a brick and mortar facility to latch onto, the odds of an Internet gambling company exhibiting interest in operating lawful poker betting websites out of Alaska in 2019 are not great. Besides Perry Green, who won three WSOP bracelets during his real money poker playing career, Greg Hobson  is the most notable poker player from Alaska. In 2012, Hobson won the WSOP $1,500 NLHE Ante Only event. His victory was good for $256,691. The very next year he finished 11th in a 6-max poker gambling event. With a population that is 700,000 strong, and with many who do not possess an Internet connection, Alaska is not exactly a top candidate to regulate online legal poker websites for 2019. Not only are its citizens largely opposed to Internet gambling but there are also no prominent pro poker betting lobbyists residing in AK state. Compounding matters, Alaska is located so far from the lower 48 states, that its prospects of forging an interstate lawful poker gambling compact are minimal at best. Plus, let’s not forget that the proper Internet gambling oversight committees have yet to be put in place in AK. Sorry Alaskans, regulated online real cash poker Texas Hold’em websites won’t be coming to your cabins anytime soon but who knows what’ll happen once the year is over.